The OrangeA 4 Color 1 Station Silk Screen Printing Machine is a very nice machine for people and small businesses just getting started with screen printing that are looking to find their feet. It’s excellent for beginners to test with and learn the ropes, and even larger businesses that are used to the process of screen printing can benefit from this cheap and straightforward machine on hand. Made of sturdy materials, once it’s put together properly, it can stay up and running for a great deal of time. However, it’s certainly not without fault. Some tricky setup, some uncertain glitches, and one or two trips to the internet may be some hurdles you face, among others. This machine is made to print on many different kinds of materials. Though shirts and fabric will probably be your first port of call with the OrangeA screen printing machine, it can also handle plastic, metal, glass, ceramic, leather, and more. It’s not the most complicated machine in the world, and though it may not have all the bells and whistles of more expensive presses, it’s good at getting the jobs done that it was designed for. Simplicity is the name of this game. Stand-Out Feature: It has an impressive ability to print with four colors in one pressing station. Having the “4 Color to 1 Station” feature makes this silk screen printing machine great for multitasking with different colors in different sheets. The station itself – where you place the piece you’ll be printing on – doesn’t move. However, the four arms in charge of the screen and colors, which are above the station, rotate as needed to complete a great deal of work in an efficient time frame. This is the feature that elevates this screen printer above cheaper models, in our opinion. It’s great to have the option to move into multicolor prints once you’ve mastered the single color. You can really grow your skills with the machine. The machine has been created to work with four different screen plates at once so you or your business will be able to print on any surface, as long as the object fits on a platen this size: 21.7″ x 17.7″. So, even if you’re not getting into a small printing business, and are instead at work running clubs, campaigns, work retreats, charity events, or even being parent of the year when it comes to printing shirts for your kids’ school dances or other extracurricular activities – this is just the kind of machine to get started with. This machine does come with a convenient registration, which will help keep your graphics lined up as they’re needed during the printing process. That being said, we found this part of the setup a little tricky. Instructions are included, so between those, previous knowledge of screen printing machines (if you have any), and information that can be looked up online, it shouldn’t be too difficult to get it up, running, and working smooth. Once it’s set up after its delivery, there should be no maintenance or upkeep required before you’re ready to get to work. Another good feature is the fact that more plates and stations can be added on if necessary with the growth of a project or business. If one plate isn’t enough to cover the amount of work needed, it isn’t difficult to upgrade the machine with extra parts to help finish the job. You can adjust the machine however you like to best fit your material and screen. The double-spring devices can be adjusted according to the weight of the screen frame you’re using, and you can also move the screen clamp up and down the material as you see fit. Probably the most eye-catching positive about this screen printing machine is the cost. In our eyes, there’s no beating the price tag, even if you do have to compromise a little on the quality. Because of the low price, it makes for an equally low-risk kind of investment for those just getting into the world of screen printing, but who aren’t yet ready to fully commit yet. It’s perfect for smaller businesses that want a machine that can power through basic prints quickly, at a price that will fit neatly into a small budget. T-shirts are easily the most common option when it comes to screen printing, but with this machine, that is only one of many surfaces it can tackle. Theoretically, as long as it’s flat enough for press printing and can fit on the plate station, this machine will have no problem. Clothing fabrics, woven fabrics, leather, glass, wood, plastic, metal, ceramic, and other materials suitable for silk screen printing – this machine definitely has it covered. This machine is the 4 Color 1 Station option made by OrangeA, but that doesn’t mean it needs to stay as a single station. It has the ability to add up to three more stations, if needed, for a larger workload. It isn’t limited to what comes with it and its work capacity can be easily expanded. We love that it can grow with your skills and projects as you learn. The OrangeA screen printing machine certainly wouldn’t be considered a fancy machine but that’s not a bad thing. Once up and running, it’s designed to be simple to use and execute with – no fanfare and no confusion. With four different colors for printing, even multicolored work can get done quickly. As with most new machines, it can take some getting used to, but once you’ve got the hang of it, it’s easy to do a lot of projects in a short amount of time. One of the first things you’ll notice about the machine is that it’s pretty heavy duty. This is thanks to its all-metal construction. This is definitely not a machine that’s going to fall apart at the first hint of pressure. It makes a nice change after years of using DIY print screens, let us tell you! As a bonus, it’s also easy to clean after use. Another great feature of the OrangeA 4 Color 1 Station Silk Screen Printing Machine is that you can personalize it according to your needs. The screen clamp can be moved up and down as you wish — providing the material you’re using is less than 1.2″ thick — and the double-spring devices can be adjusted to carry screen frames of different weights. It’s a relatively versatile machine. We’ll be honest: we were a little bamboozled when trying to assemble the OrangeA screen printing machine. Those unfamiliar with screen printing devices might be surprised at just how many parts it takes put together. Instructions are provided, but sometimes they don’t seem quite clear enough for the task at hand — we recommend consulting Google if you’re really stuck. Hardly considered a con for someone looking for a more basic and simple machine, but if you’re in the market for something more advanced – something that can print on multiple objects with more technology – then look elsewhere for a more automated machine. This is a straightforward device but definitely old-news for experts or larger businesses. Screen printing professionals, in particular, may find it a little lacking: the registration can’t always be relied upon for picture perfect prints. We’ve really got to stress that this is a beginner’s machine, first and foremost. After completing the somewhat arduous task of assembling this machine, we found ourselves ending up with a fair amount of “spare parts”. Even if everything is properly assembled, one piece being just slightly off center can lead the arms to operating improperly – sticking or refusing to rotate. If you run into this problem, you’ll have to just take the machine apart again and reassemble: it usually fixes it. However, this is a frustrating process and can lead to some unsatisfying results if you don’t test drive it first. This OrangeA Silk Screen Printing 4 Color 1 Station is a great, low cost screen printing machine for beginners but it’s definitely not for everyone. If you’re new to the idea and work of screen printing, and want to try something durable and affordable to get you started, this is a great machine to function as kickoff point to a growing hobby or career. It’s an efficient way to get things printed for smaller projects or even as a trusty backup for bigger work if needed in a pinch. Have you tried the OrangeA 4 Color 1 Station Screen Printing Machine yet? The OrangeA 4 Color 1 Station Screen Printing Machine is a cracking purchase for beginners and those who are looking for a basic and efficient screen printing machine. It doesn't have a lot of bells and whistles, and the assembly is a little tricky, but it's easy to use and available for a good price. Welcome to the Material Crafts portal of Craft Schmaft. 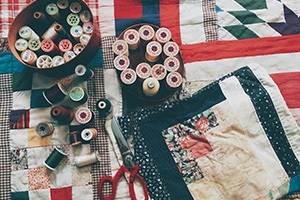 Here we focus on everything you need to create amazing material creations — from quilting to applique, heat pressing to jewelry making. Take a look at our latest posts.